Please note: This particular page is under construction. If links and/or images don’t work, that’s why. We apologize for the inconvenience. You can buy the replica coins through ebay, but none of the other stuff. 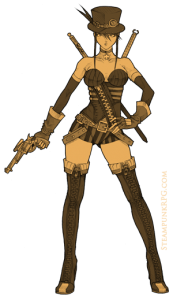 Part of the reason for that is because a lot of this stuff is one of a kind and it is hard to keep up with the changes. If you are interested in buying any of these items, please email us at UberGooberGames[email protected], and we’ll send you a paypal invoice. List price: $6.99 but discounts for multiple quantities. 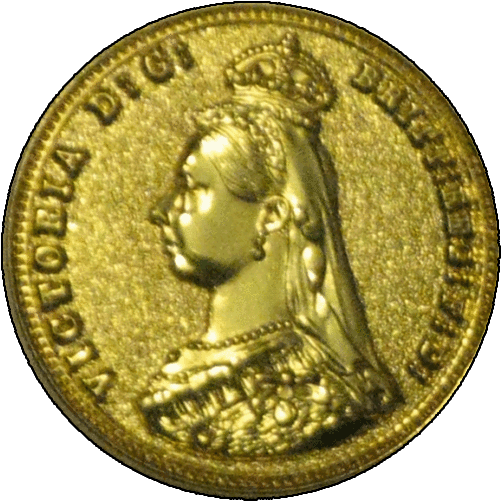 For Queen Victoria’s golden jubilee year of 1887, a new design was produced for all gold and silver coins, showing Victoria wearing a small coronet. Although the jubilee head coin issues are now very popular, they were much criticised at the time. 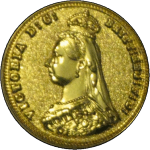 Jubilee sovereigns were struck from 1887 to 1893 inclusive. 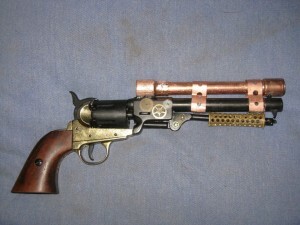 This is a modified authentic replica of an 1861 Navy Issue Revolver with brass assembly. These normally retail for $100 without modifications, so I think this is a significant deal. 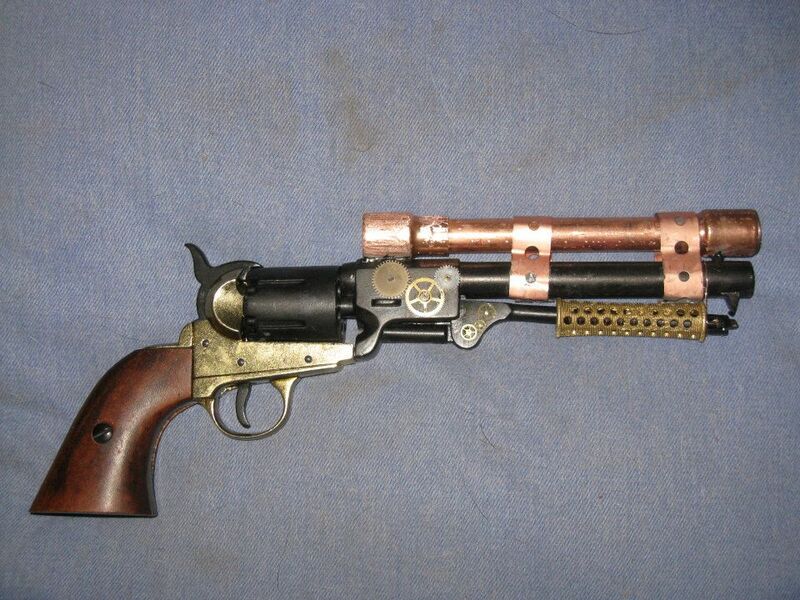 The copper sight/tube is hollow (no lenses or anything) but the hammer does pull back and fire, and it looks like you could put a cap in it, although I haven’t tested that. The barrel is not hollow, so you can’t actually ever fire anything down it. 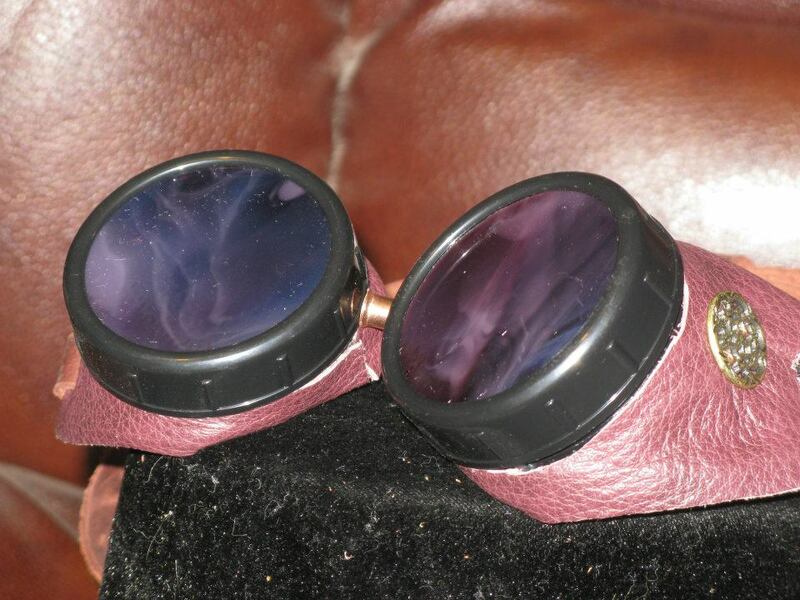 An individual artist at Über Goober Games has handcrafted a limited number of custom Investigator General Nykolas’ Supernatural Hunter Kits against all things malignant and supernatural. 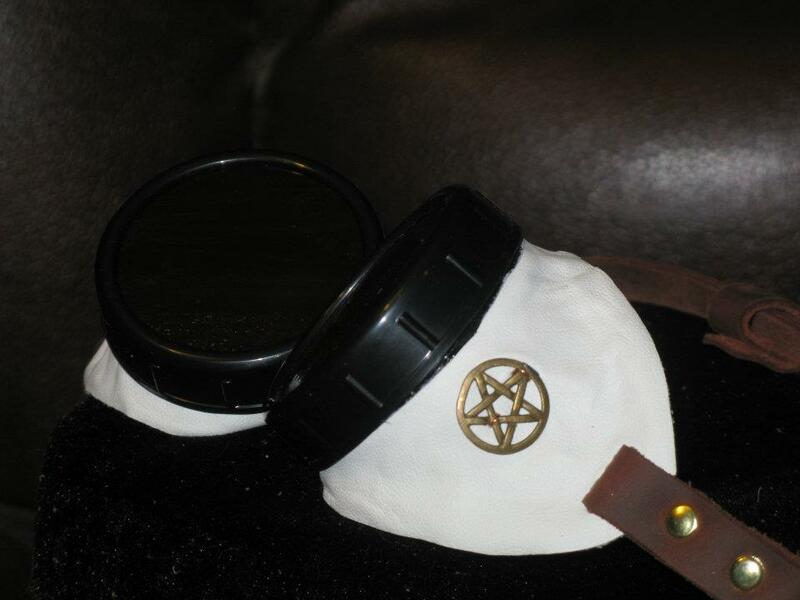 Unlike this Personal Protection Kit, this is a bigger version for serious supernatural hunting business. 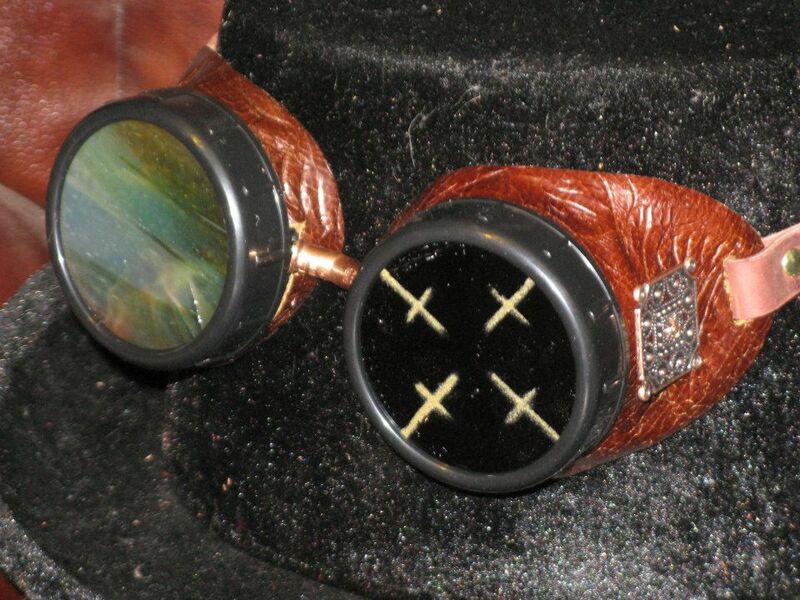 This elaborate, detailed, and original primitive-style Victorian/Steampunk era supernatural hunter kit was painstakingly created by hand for just that purpose. 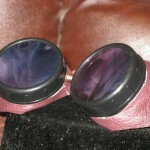 Excellent for the collector, the role-player, or someone interested in supernatural lore or the occult. 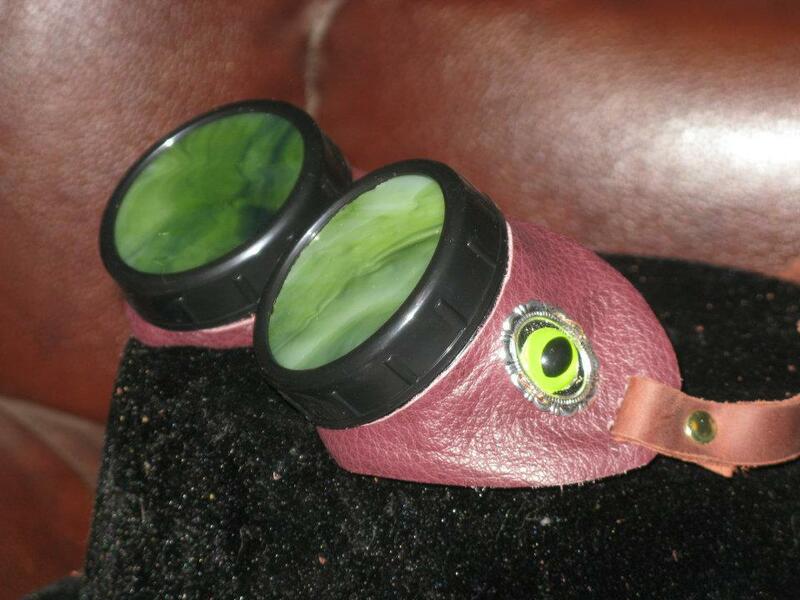 I only have enough materials to make 10 of these total, and so far I’ve only made two and they sold right away. If I don’t have any on hand and you want one, contact me and I’ll start on one right away. 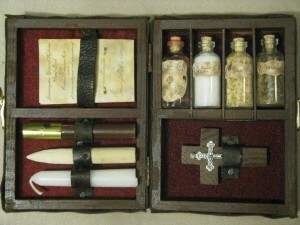 This is a large sized (9” x 15”) original-style supernatural hunting kit with an authentic look, made to seem over a century old. 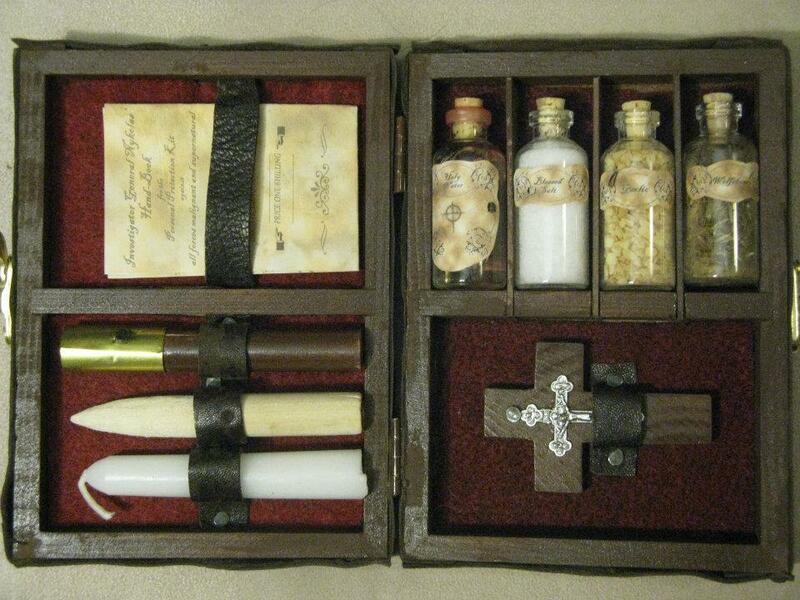 IT IS NOT MERELY A VAMPIRE HUNTING KIT. This kit was created after meticulous research, and includes materials to protect against and hunt vampires, werewolves, demons, ghosts, and miscellaneous undead. A sturdy metal-bound wood box decorated with a large wooden cross and lined with scarlet felt. 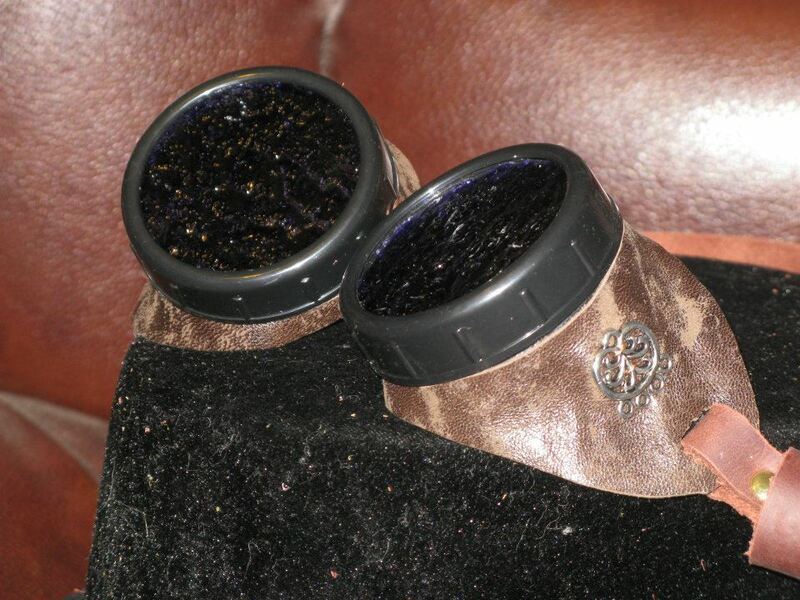 Authentic holy water (blessed by a Catholic priest) for burning and warding against demons and vampires. 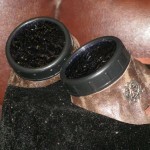 The holy water bottle has been additionally sealed with wax to prevent leaking until needed. In some cases the wax colors the water, but it is pure nonetheless. Kosher rock salt for circles and lines of protection against the dead and undead. Actual wolfsbane to burn and ward off werewolves. A solid brass crucifix for warding off evil. A solid oak sharpened wooden stake with attached cross for combat against vampires. A wooden hammer with attached crucifix for hammering stakes. 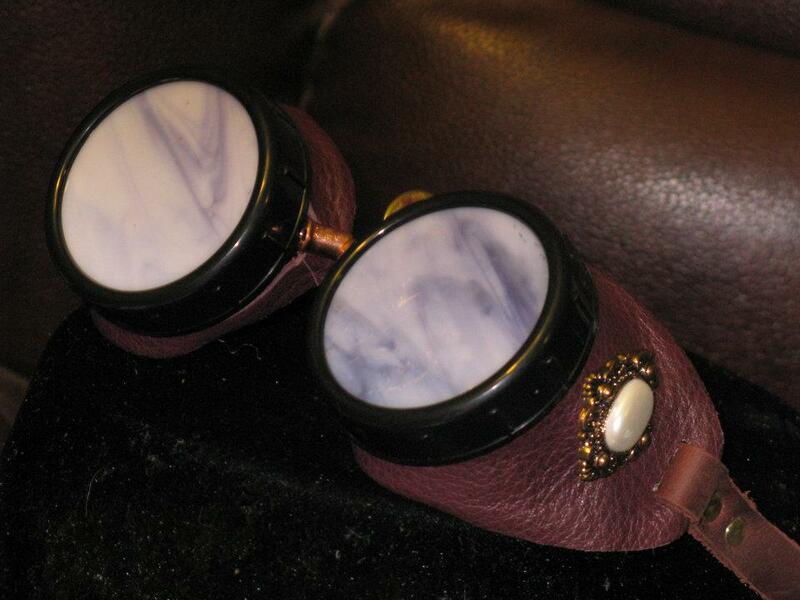 A functioning antique style set of black iron manacles for capturing evil or their minions. Comes with key. 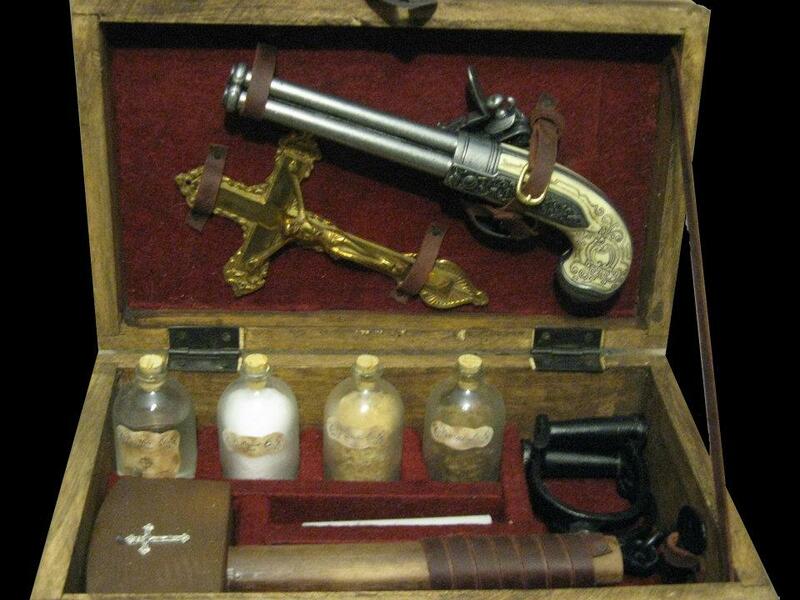 Note: This is not a small protection kit, this is a kit for the serious hunter of supernatural creatures. This kit is not an antique. 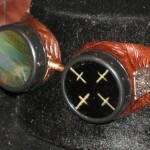 Every piece is handmade, new, or re-imagined by the individual artist. There are less than five of these in the world, I don’t anticipate making more than ten total, and each one is one-of-a-kind with tiny variations from the others. 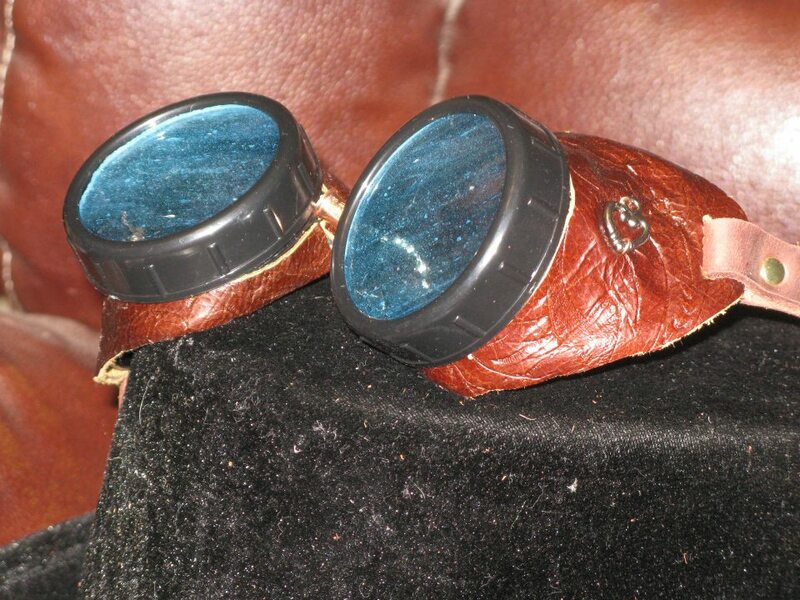 An individual artist at Über Goober Games has handcrafted a limited number of custom Investigator General Nykolas’ Personal Protection Kits against all things malignant and supernatural. 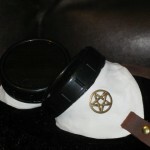 Wanting a kit for dealing with the supernatural you can actually carry around with you? 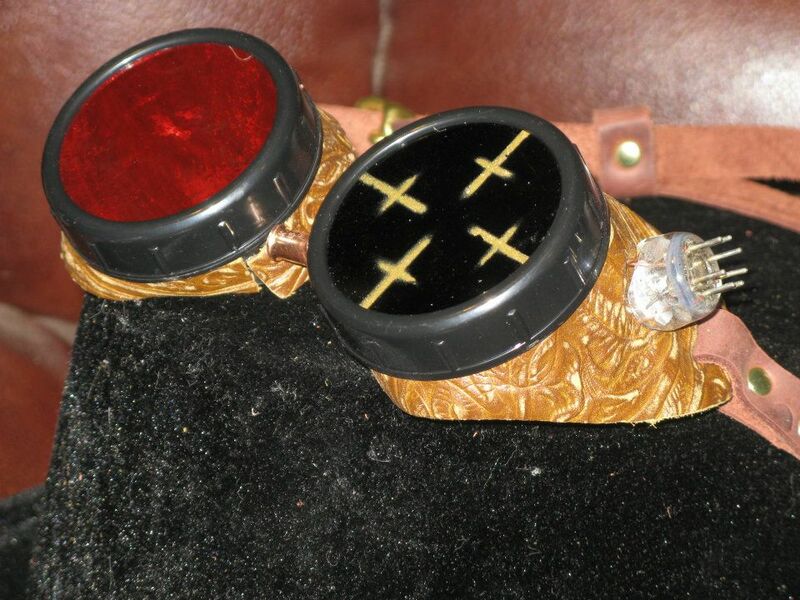 This elaborate, detailed, and original primitive-style Victorian/Steampunk era supernatural protection kit was painstakingly created by hand for just that purpose. 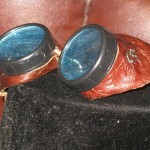 Excellent for the collector, the role-player, or someone interested in supernatural lore or the occult. 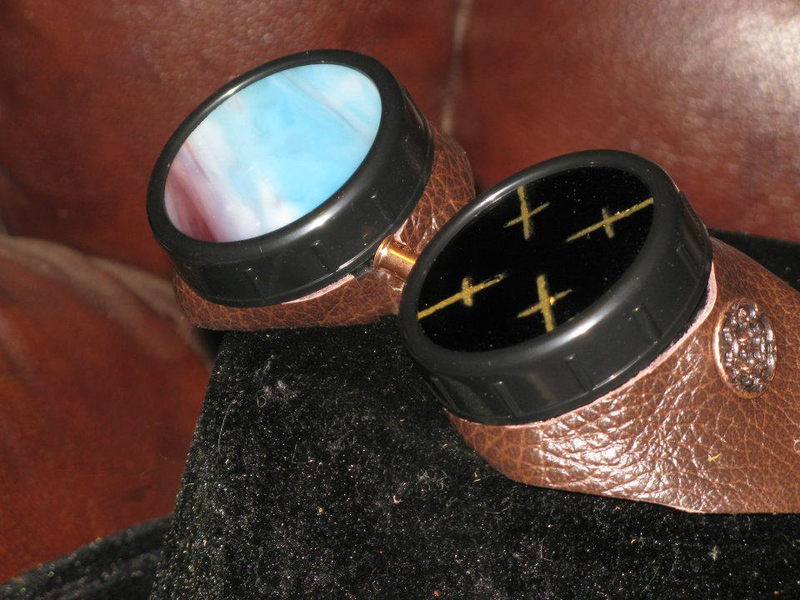 This is a personal sized (4 ¼” x 6”) original-style supernatural protection kit with an authentic look, made to seem over a century old. IT IS NOT MERELY A VAMPIRE HUNTING KIT. This kit was created after meticulous research, and includes materials to protect against vampires, werewolves, demons, ghosts, and miscellaneous undead. 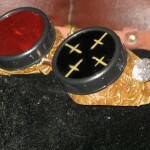 A leather bound box decorated with a large wooden cross, brass clasp, and lined with scarlet felt. A trademark 2-piece wooden stake with extra strong lodestones (magnets) to hold the two pieces together for combat against vampires. A small hand-made wooden cross with attached crucifix. Note: This is not a hunter kit, although a stake is provided. This is a kit to the discerning and discreet lady or gentlemen to carry with them for that added security in the darkened alleyways or urban sprawl. This kit is also not an antique. 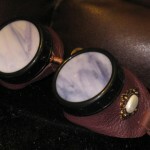 Every piece is handmade or new or re-imagined by the individual artist. 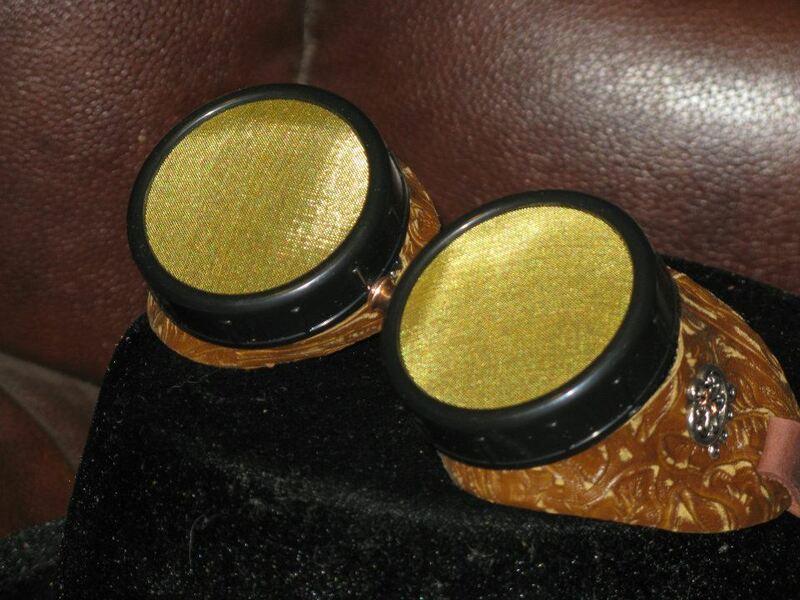 There are less than five of these in the world, and each one is one-of-a-kind with tiny variations from the others. 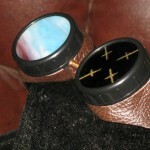 All the non-brass-screen lenses are handmade hand pressed hand cut glass. Each is an individual work of art and you won’t see any two that are identical. 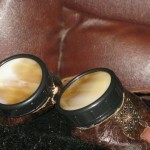 Many of these are opaque or only semi-transparent, and obviously couldn’t be worn over the eyes. 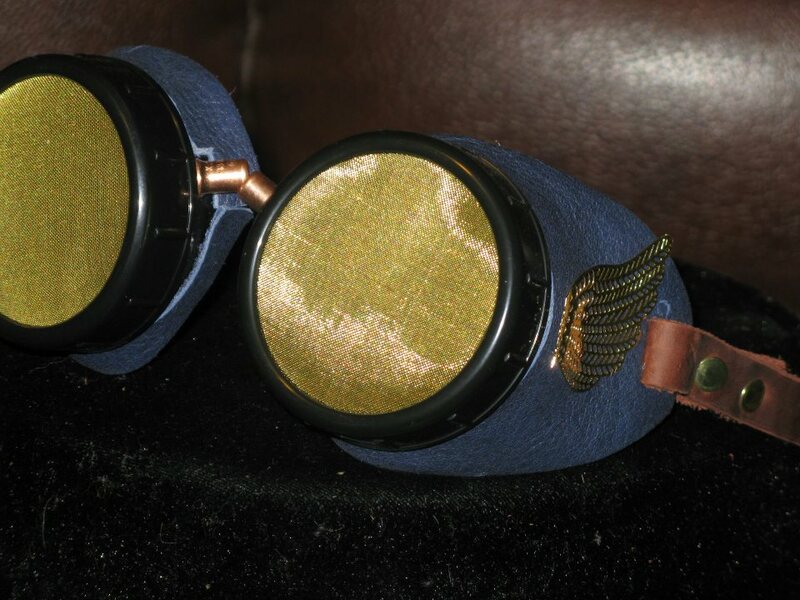 I assumed very few people would be hopping on a zeppelin after they bought the goggles, so they are designed more for aesthetics than practical use. 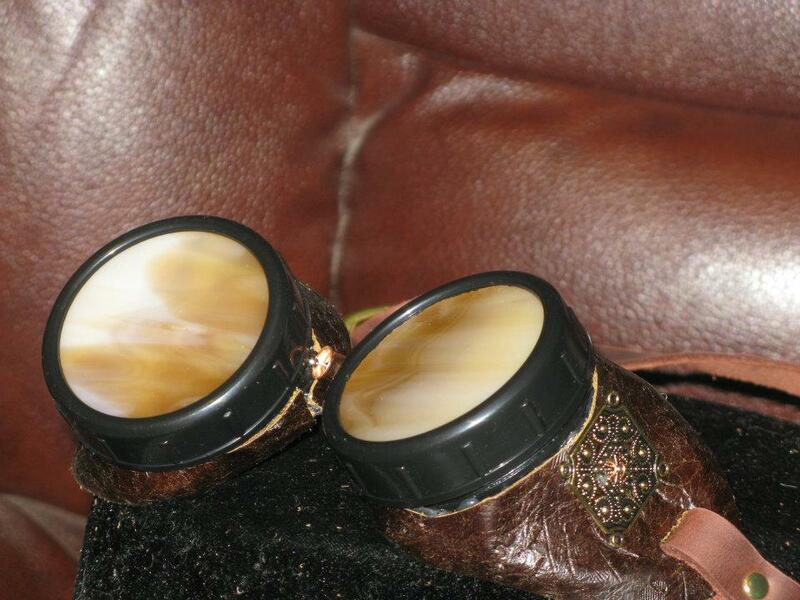 I’ve noted where the lenses are opaque, semi-transparent, and actually transparent. 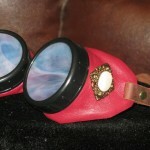 They are all embellished with various unusual types or colors of leather. 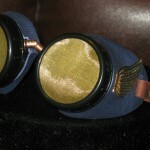 The straps are all leather, and particularly long so they will fit over heads or hats. 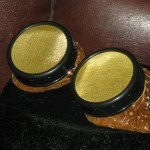 All straps are connected with brass brads. 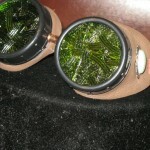 Right lens opaque, left lens green and transparent. Brass screen over plain green glass. Transparent. 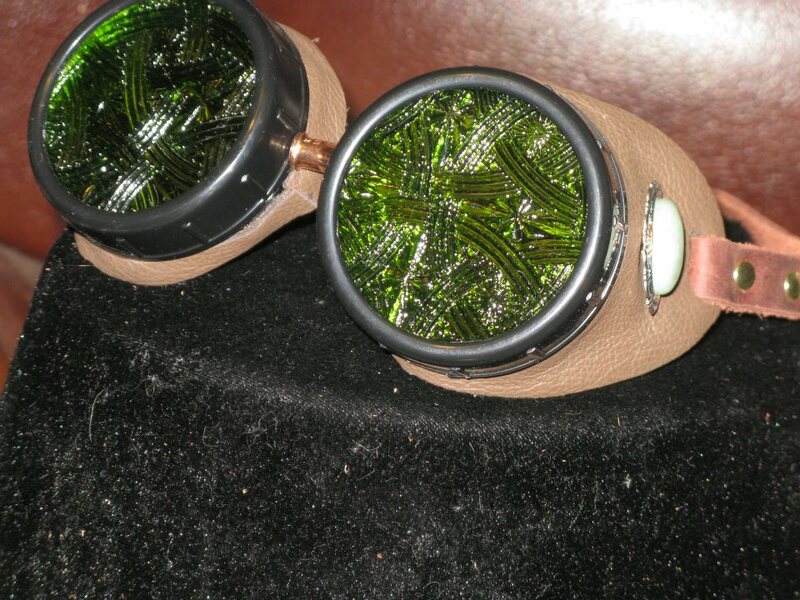 Both lenses semi-transparent (Textured green). 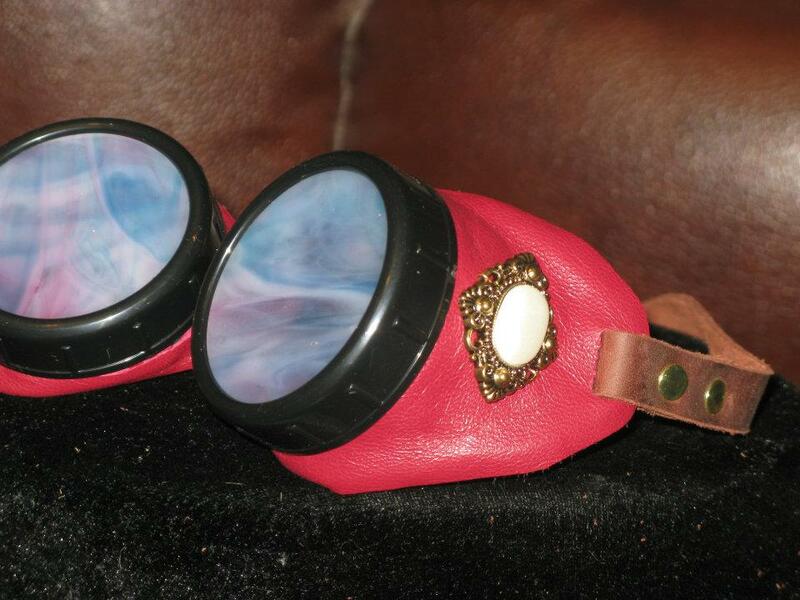 Both lenses semi-transparent (Light Blue). 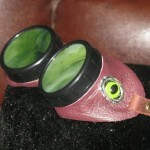 Right lens red and semi-transparent, left lens green and transparent. Very odd to see red in one eye and green in the other.